Yesterday afternoon, I got a call from my mother that I'd been waiting on for about eight months - my sister yesterday gave birth to a healthy baby boy, Andrew. My first nephew, my parents' first grandchild, my maternal grandparents' first great-grandchild (my sister did pull a surprising piece of mental cruelty by telling myself and my parents that she was expecting some two or three months before she told my grandparents, forcing us into the torturous position of having to keep our mouths shut about the one thing we knew they would be estatic to learn). So, in honour of this happy event, I am going somewhat out of character giving this post entirely over to cute baby pictures! 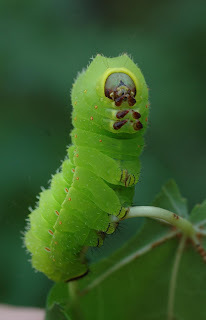 Polyphemus moth caterpillar. Photo by Mick Phillips. 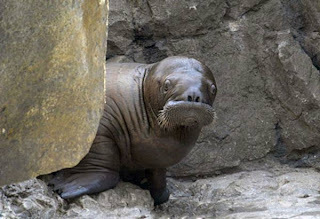 Baby walrus (Odobenus rosmarus). Photo from Gothamist. Porcelain crab larva. Photo by Jean-Marie Cavanihac. 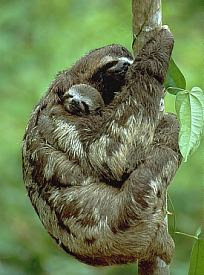 Sloth mother and baby. Photo from Green Tracks. Fungia (mushroom coral) larva. 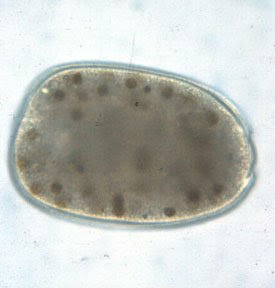 The brown spots are symbiotic dinoflagellates. Photo from the Weis Lab, Oregon State University. Mouthbrooder and young. Photo from Deeble & Stone Productions. 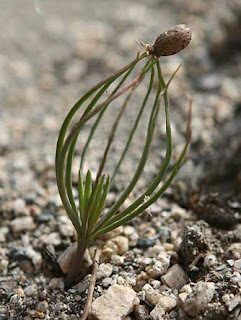 Ponderosa pine (Pinus ponderosa) seedling. Photo from here. 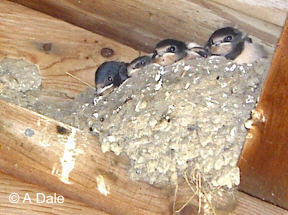 Swallows. Photo from A Nature Observer's Scrapbook. 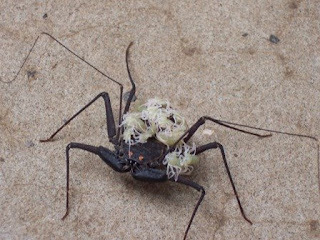 Amblypygid carrying babies. Photo by Laurel Symes. Congratulations and all that. You deserve to be overjoyed. Congratulations Uncle Christopher! And thank you for the cute baby photos. "Yesterday afternoon, I got a call from my mother that I'd been waiting on for about eight months - my sister yesterday gave birth to a healthy baby boy, Andrew." I think you better hope your sister doesn't see this post - do you really want her to know you compared her child to Fungia and an amblypygid? Congrats! Now I have a question about arthropod metamorphosis: Is extreme metamorphosis (like a caterpiller turning into a butterfly, or an aquatic fish-eating dragonfly larva turning into a dragonfly) basal for Arthropoda, or is it a derived trait unique to insects? I ask this because I notice that arachnids hatch as tiny versions of their parents. Well obviously I didn't hear about it the instant it happened, did I? do you really want her to know you compared her child to Fungia and an amblypygid? Is extreme metamorphosis (like a caterpiller turning into a butterfly, or an aquatic fish-eating dragonfly larva turning into a dragonfly) basal for Arthropoda, or is it a derived trait unique to insects? I ask this because I notice that arachnids hatch as tiny versions of their parents. 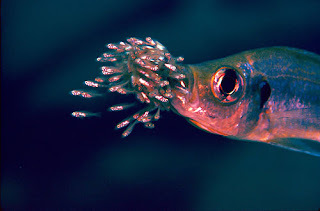 Really basal insects, such as silverfish, also just hatch out as miniature adults. Pterygotes (winged insects) originally had distinct nymphal and adult stages, though in some cases the only real difference between nymphs and adults is that nymphs don't have wings. The successively most basal pterygote orders, mayflies and dragonflies, both have aquatic nymphs (not, technically, larvae), but it's rather an open question at the moment whether the aquatic nymph is ancestral for pterygotes as a whole or independently derived in those two orders (a third order of insects with aquatic nymphs, stoneflies, no longer appears to be as basal as once thought). Complete metamorphosis (larva to pupa to adult) characterises a derived clade of insects called Holometabola that includes (among others) beetles, flies, Lepidoptera and Hymenoptera. Complete metamorphosis has also arisen convergently in some other insect groups such as thrips and scales. It is worth noting that mayflies are the only group of pterygotes that go through a moult after they reach maturity. This is actually not an easy point for people to get their heads around, especially in relation to ant species that have different size classes of workers. Little ants do not grow into big ants. Once an ant has hatched out as a fully-developed adult, that's it. Most larger arachnids, as well as myriapods, hatch out as miniatures of the adults, but mites and ricinuleids have a distinct larval stage with only six legs instead of eight - the fourth pair grows later. Pseudoscorpions, IIRC, have a somewhat degenerate larval stage that is nursed by the mother attached to the underside of her abdomen. Crustaceans, of course, engage in a whole host of bizarre developmental pathways. Oh, very cute! Especially the mamma Amblypygid. And congratulations on the new namesake! "Well obviously I didn't hear about it the instant it happened, did I?" I meant more that it sounded like you were calling your sister every week--"Had the kid yet? Sigh! Ok, I'll call back next week." When are you going to get to see your nephew? We were hoping to be able to get over to New Zealand and see the baby at Christmas, but finances (or lack thereof) intervened, so we probably won't get to see him until he's a couple of years old. Such happens when you live in different countries. I'm sorry! One of my coworkers is from China and her son was back in China with her mother for about a year. They would videoconference by webcam and her mom emailed her videos. It's great that we can send video and photographs so easily now.